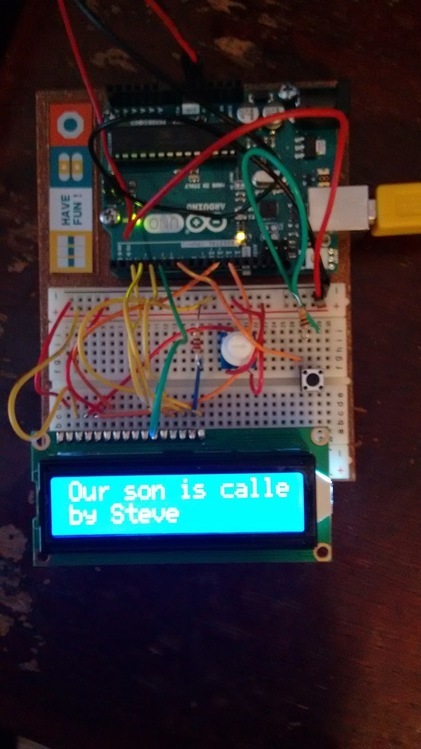 Read a message from the serial console, and display it upon the LCD. Because we allow long-inputs, we'll implement character scrolling. To allow arbitrarily long messages we assume user will add '#' to terminate the input. Once read the message can be dismissed by pressing a button. Pressing the button will clear the display. Wire the LCD display to the arduino, as per project 11 in your starter-guide. Wire a button to a spare input-pin, as per project 2 in your starter-guide. In the sample code listed below this is pin 7. The code is pretty simple, if you've already completed the starter-project you know how to display text upon the screen. We're just updating that example to read from the serial console, when data becomes available, and clear things when the button is pressed. This program reads strings from the serial console, and displays them on the LCD. The message received will be scrolled unless/until the button is pressed to clear the display. // The two lines of text. // The scroll-offset for the first line of text. // The button we read for clearing the display. // If we have serial input available ..
// And we've not yet filled our input buffer. // Copy this text to the first-line. // Replace any non-printable characters with a space. // Add spaces to the end, so it scrolls off the display neatly. // Empty our input buffer, and reset our stcroll-state. // Move to the top-left. // Draw 16 characters from the start of the first string. // Show the second inline. This is the default message. NOTE: The "#" character will signify the end of the message, and will not be displayed. The new message will cheerfully scroll across the first line of the display, and will continue to do so until you press the button you've wired up. Think of the button as an "acknowledge & clear" thing. ProTip: If your board is connected to a Linux system you can update the message from your shell. At the moment the first line always scrolls. Can you make it only scroll if the input is longer than the 16 characters that will fit on it? The second line just contains the string "by Steve". Can you split the message across two lines, with no scrolling, if the message is less than 32 characters? If you're using a D1-mini, or some other board which has built in networking, can you make the message come from a remote HTTP server?